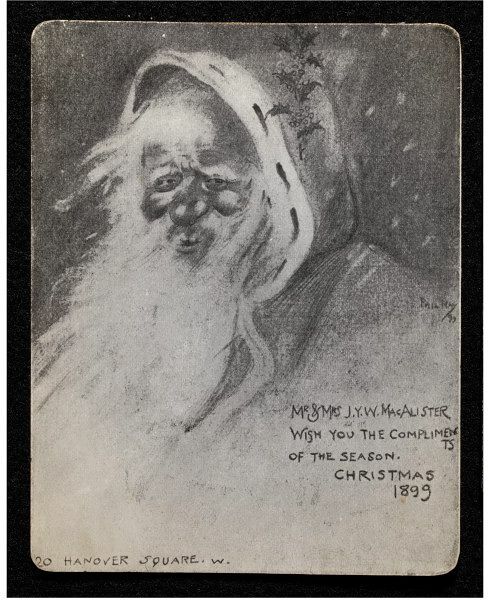 In keeping with its editorial policy of always looking on the bright side of the holidays, this blog has previously examined a scary snowman, strange Christmas presents, and Christmas in the graveyard. Since my story about an evil nativity scene is still in draft, Santa is the target for today. It is axiomatic that Santa knows if you’ve been bad or good; naughty or nice. But what happens when a ho ho horrible Santa goes rogue? The Grinch could have taken a tip from these burglars. Disguised as Santa Claus, He Robs a Chicago Home. Seattle, Was., Dec. 25. Oscar Hemptner, a taxicab driver, believes he had as a passenger Christmas Eve a burglar disguised as Santa Claus. Hemptner’s passenger hailed him early last night and said he wanted to deliver some Christmas gifts in a “quiet way.” He carried a large sack, presumably filled with presents and a small parcel containing a Santa Claus disguise. Stops were made in several residence districts while the passenger, carrying his bundles, went up the alleys to play his part. This next story also calls to mind a beloved holiday movie, Miracle on 34th Street, and the “sanity trial” of Kris Kringle. Rufus L. Griswold, the Cleveland educator who holds that it is wrong to let children believe in Santa Claus, was arguing about his strange views at a dinner. “Why lie to children?” he asked. “Why let them believe in a myth? Whenever I hear mention of that loathed name of Santa Claus, I think of a lunatic. Some years ago I attended a trial. A witness was being examined as to the sanity of one of the inmates. “’You hold that this inmate is insane, do you?’ a lawyer asked. “’I do,’ was the firm reply. The last thing those stressed by the holidays need is a mad Santa. This bizarre fellow seems to have stepped straight out of a Santa slasher film. Fowl Figure in Foul Fashion in This Peculiar Holiday Stunt. Dead Chicken Heads and Blood Scattered About Allsop’s Home By Man Who Says He’s Santa Claus, But Who lands in Jail. Although Santa Claus is popularly imagined to be a genial soul who comes down the chimney, Harley Allsop and his wife Martha, living at 811 North Seventeenth Street, aver that he came to their home in malevolent guise Sunday night and tried to do them dirt. The police believe that this evil Santa is now in jail. It was the witching hour of midnight when a knock sounded upon the door of the Allsop home. “Who’s there?” queried Harley, after the approved manner of the prudent householder. “Santa Claus,” replied a voice which Allsop could not list as among those of his friends. Straightway there came an awful squawking and fluttering, he told the judge in police court. He leaped from his couch and opened the door. There on the threshold lay the head of a chicken newly slain, while a trail of blood led down the steps. Other trails of blood led through the house itself. Allsop called the police. Scattered through the house they found the heads of no less than nineteen deceased fowls, while gore was everywhere. Quick work on the part of the officers brought in R.E. Cravens, upon whom the brand of suspicion was placed. “He had ‘downs’ on his coat, judge,” said Detective Rooney. “Inside and out. Here y’are.” And he laid upon the judge’s desk a little yellow feather. Cravens gazed upon “exhibit A” and gulped, but said nothing. The judge gave him fifteen days. Once again recalling the opening scenes of Miracle on 34th Street, we find an intoxicated Santa, although the general melee described here does not appear in that film. Santa Claus is in disgrace. He got drunk yesterday and for this act of indiscretion received a broken jaw. He did well, however, to show his superiority, and whipped half a dozen men. This was not the same good Santa Claus who brought all the good children presents yesterday, although he looked very much like him. This Santa Claus was personated by Charles Hersog, who says he is a ranchman. Hersog, and a number of men who idle about the streets and are commonly called “hoboes” met in a vacant room near Thirteenth and Market streets yesterday to celebrate Christmas. None of them had any money, so they would go out on the streets and beg it and spend it for beer. They had a high old time. About noon one of the beggars returned to the room with a Christmas tree and a full set of Santa Claus whiskers, which he said he had found in an alley. “We’ll have a Christmas tree ourselves,” he said, as he dumped his find in a corner of the room. All the man wanted was to be Santa, but it was decided that the man who had the most money to contribute could be Santa. Hersog had 27 cents and was Santa. He put on the whiskers, stood the tree up against the wall and on the limbs tied beer buckets. His 27 cents went for beer and the cans were all filled. Each man present would have his name called by Hersog and would walk up just like a little child and receive his bucket of beer. But Santa Claus made a mistake. He sampled every bucket of beer which he handed over and got so drunk that he called one man’s name twice and left another sitting back with no bucket between his hands. The empty-handed individual entered a protest. Santa Claus insisted that he had already received hi bucket of beer and the empty-handed individual called him a liar. Some bad Santas were not born bad, but had malevolence thrust upon them. Holiday merry-makers of the 19th century scorned ordinary methods of distributing Christmas presents. Newspapers, books, and magazines vied to come up with novel ways to pass out gifts. This particular method seems like the nightmare before Christmas. Knowing the need, we are sure this novelty will be found useful at all private and public holiday parties, the managers of which are tired of the worn-out methods of amusing both old and young. It will seem surprising to the spectators, but will be found less trouble in its preparation than most of the ancient ways of distributing Christmas presents. When the children are admitted into the hall, vestry, or parlor, they see on the platform, or at one end of the room, a long table, covered to the ground with a red or white cloth brilliantly lighted with candles at the corners. After an opening song, or piano music, a gentleman enters, bearing under his arm a thin box about three feet in length by two feet in width, and six inches in height. This he places upon the table; and after standing it carelessly on its edge, lays it down with the front side towards the audience. The cover is tightly fastened with a common brass hook in the front edge, and has hinges at the back. A little girl comes forward from the audience and carefully unclasps the hook, when the lid of the box flies open with great force, and a tall Santa Claus figure, with flowing wig and beard, in a red fur-trimmed robe, springs up and makes a funny little speech, after which he bows low to the little girl, and hands her a present marked with her name. Then he disappears as mysteriously as he appeared, and the little girl fastens him down with the clasp. This is repeated by one after another of the audience until the gifts have been all distributed, when the box is carried away again. If time does not serve for every child or person to open the wonderful box, after a while a whole class or division may receive their presents from Santa Claus without his departure ; but in small family parties it will be far more fun to let each child unclasp the box for himself. Sometimes Santa Claus may seem unwilling to go down into his box, and some gentleman may find it needful to push him down very hard, and at the end of the performance, he may be so obstinate that the gentleman may find it necessary to push down the right hand only to see the left rise up very stiffly, then as he pushes down that, the right rises in turn, and finally having pushed all but the head down, he finds it so obdurate that he is compelled to take it off and pack it by the side of the figure before he can close the lid so as to carry off the box in the same way that he brought it in. This very effective scene can be easily prepared, as the table is made of a frame only, on which the cloth is tacked, the front and sides being lined, so that they will not be transparent. This frame consists of four posts thirty inches high, with a strip of light wood three inches wide, and six feet long, nailed at the top and bottom of the posts, and with strips of the same width, and four feet in length at the sides. Across the top of these two other strips are nailed, two and one half feet apart, to hold the box. These upper strips are placed between the top strips so that the table-top will be level, and the cloth overlaps the edges of each; and cloth of the same color is drawn tightly over a little frame which fills the space when the box is not on the table. What horror trope didn’t they include: a small coffin on a bier surrounded by candles, a lid flying open suddenly, a figure that refuses to stay down, a wire mask, a fake head… Happy holidays to you too, Mr. Bartlett. I well remember parental threats about being good for Santa. This exceptionally inventive woman kept her children “amiable” by claiming, weirdly, that Santa was in the house. Shades of Burnt Offerings. There is nothing like taking advantage of times and seasons. A Rondout [Illinois] woman has kept her children most amiable for several days by telling them she had Santa Claus in the house. She makes them believe he will be called on in times of need. This mother seems like she might have ended up as one of those people who keep corpses of loved ones in sealed bedrooms in the hopes of continuing benefit checks or resurrection.